As readers, we all know the euphoria of one-more-chapter books. These glorious novels have been few and far between for me in recent years, so when I find one, I treasure it. 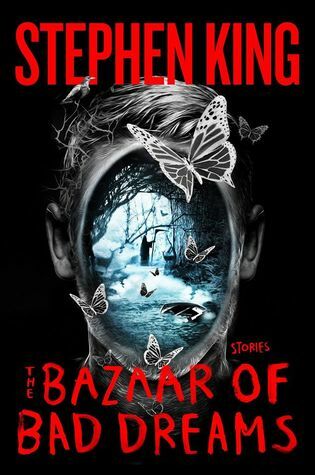 The Bazaar of Bad Dreams is Stephen King’s latest collection of short stories. I may be a tad bit biased, since Stephen King is my spirit animal. That being said, Bazaar left me spending many nights chasing after that elusive last chapter. King grasps human fear on that broad level, but his writing also hits home in a more granular way. This is on full display in The Bazaar of Bad Dreams. King has a knack for verbalizing those thoughts that everyone has, but would never admit to. In “Mr. Yummy,” for instance, a retirement home resident is given a keepsake to pass on to one of his children. When considering which of the three he would choose, his friend quips, “I’m sure you love all your children equally, you’re that kind of guy, but liking is different, isn’t it?” (351). King hits on those sorts of unspoken truths, which makes readers simultaneously feel relieved and guilty that at least one other depraved person out there has these things cross his mind. Other stories put characters in morally challenging situations. The protagonist of the aptly-titled “Morality” is offered a hefty sum of money for going to a playground and randomly punching a young child in the face. I know, I know – who would ever consider that? But then Mr. King just wears you down. This woman isn’t in the best of financial situations. The money would allow her husband to quit his 9-5 and finally finish his novel. They could move out of their cramped apartment and start over. It’s only one little punch, and that kid is so young, he’ll never remember it anyway. And suddenly, there I was, all snuggled up in my comfy bed with my fancy new book light, and not entirely disagreeing with a woman’s decision to punch a four year old. That, ladies and gentlemen, is the power of Stephen King. Every story presents a similarly thought-provoking issue. “Bad Little Kid” portrays a diabolically dangerous “child” that must be stopped, no matter what the cost. “The Bus is Another World” presents a man that must choose between being on-time to a job interview and reporting the murder that he just witnessed. And “UR” brilliantly deals with a common King theme: knowing the future and trying to change it. Plus, it features a perfect cameo from those low men in yellow coats. So there you have it. Stephen King always finds a way to make me question everything that I thought I stood for. Stay tuned for more Stephen King reviews, as The Bazaar of Bad Dreams left me with a need to revisit his greatest hits.